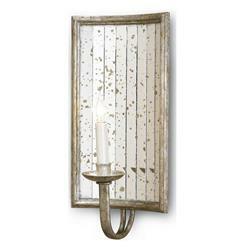 A great vintage style mirrored sconce. Perfect for deco and Hollywood Regency rooms. Individual antique mirror strips are hand applied within a wrought iron rectangle frame. The frame is finished in an antique Harlow silver leaf.